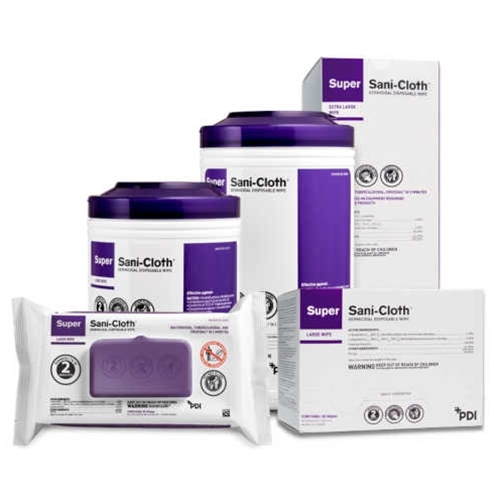 PDI Super Sani Cloth Germicidal Wipes from HealthyKin.com are an EPA registered hospital-grade disinfectant to accommodate the many situations and hard non-porous environmental surfaces found in healthcare settings. Received the product quickly and personnel seem to prefer these wipes to the disinfectant sprays they had been using. Great product. Excellent price. Fast shipping. My only suggestion is that you get a phone number that customers can call. I did get a fairly quick response to my email but it would have been faster, and just nice, to be able to speak to someone. Thank you! Got it right away. I LOVE these wipes, I like the size, it is actually big enough to quickly wipe down my whole bathroom! And I feel like they are a great "anti bacterial" wipe. 2nd time I have purchased & plan on keeping a stock of them on hand. excellent product! the shipping was super fast!! will buy again. Great deal, fast shipping. What more do you need? Perfect for travel -- Received quickly -- Thank You, will order again!! Great for our office exercise classes. Will buy again!